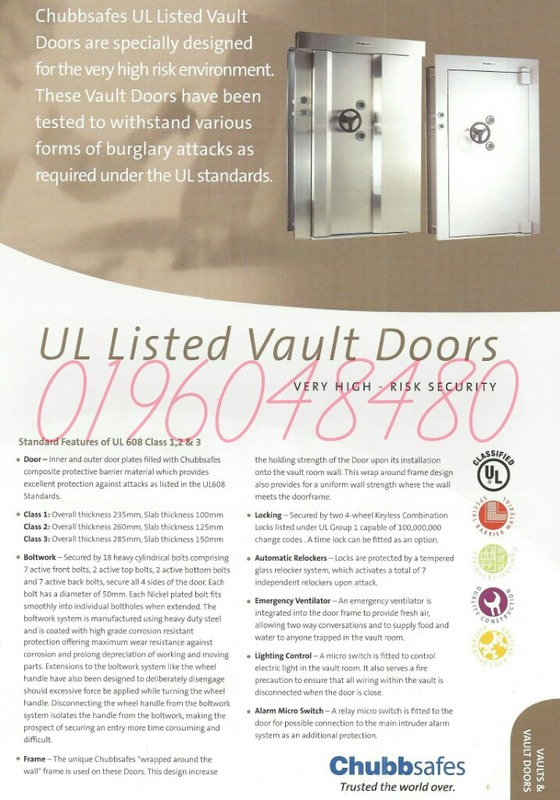 Chubbsafes UL Listed Vault Doors are specially designed for the very high risk environment. 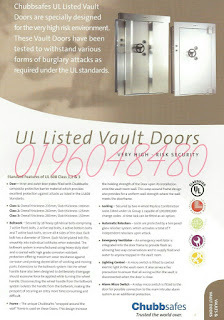 These Vault Door have been tested to withstand various forms to burglary attacks as required under the UL standards. Boltwork - Secured by 18 heavy cylinrical bolts comprising 7 active front bolts, 2 active top bolts, 2 active bottom bolts and 7 active back bolts, secure all 4 sides of the door. Each bolt has a diameter of 50mm. Each Nickel plated bolt fits smoothly into individual boltholes when extended. The boltwork system is manufactured using heady duty steel and is coated with high grade corrosion resistant protection offering maximun wear resistant against corrosion and prolong depreciation of working and moving parts. Extensions to the boltwork system like the wheel handle have also been designed to deliberately desengage should excessive force be applied while turning the wheel handle. Disconnecting the wheel handle from the boltwork system isolates the handle from the boltwork, making the prospect of securing an entry more time consuming and difficult. Frame - The unique Chubbsafes "wrapped around the wall" frame is used on these Doors. This design increase the holding strength the Door upon its installation onto the vault room wall. This wrap around frame design also provides for a uniform wall strength where the wall meets the doorframe. Locking - Secured by two 4-wheel Keyless Combination Locks listed under UL Group 1 capable of 100,000,000 change codes. 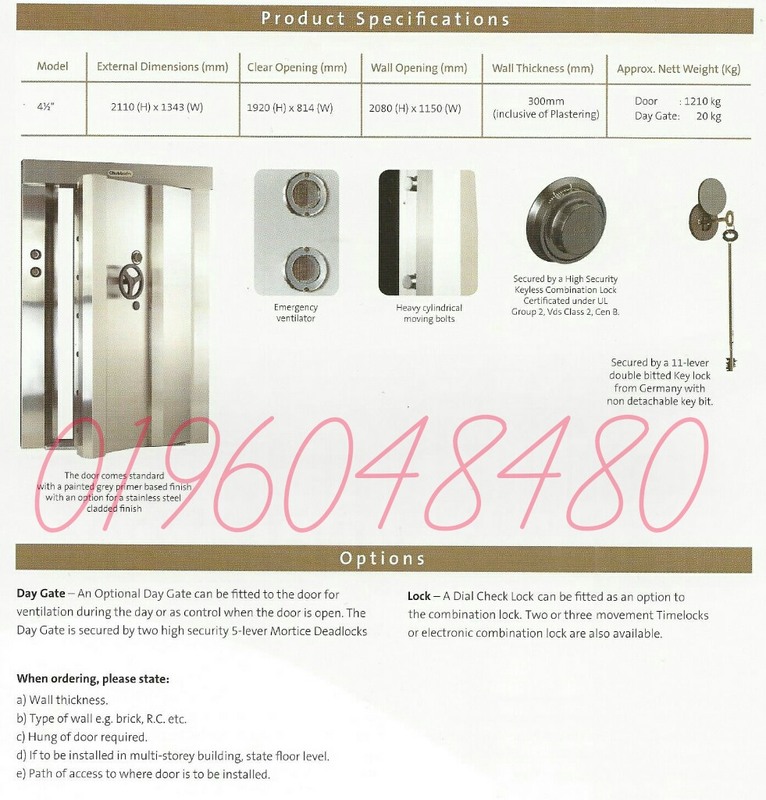 A time lock can be fitted as an option. Automatic Relockers - Locks are protected by a tempered glass relocker system, Which activates a total 7 independent relockers upon attack. Emergency Ventilator - An emergency ventilator is integrated into the door frame to provide fresh air, allowing two way conversations and to supply food and water to anyone trapped in the vault room. Lighting Control - A micro switch is fitted to control electric light in the vault room. It also serves a fire precaution to ensure that all wiring within the vault is disconnected when the door is close. Alarm Micro Switch - A relay micro is fitted to the door for possible connection to the main intruder alarm system as an additional protection. To be rated as a UL Listed Door, the door has to pass all of the three rigorous tests conducted by Underwriters Laboratory of America professional Testers. The door shell resist the best method or combination of methods implemented to a specific area for the total working time specified. 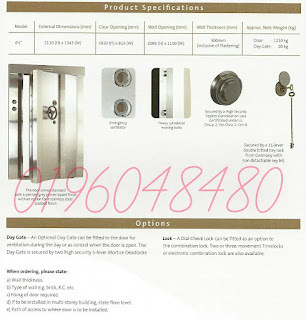 The tests are designed to authenticate the burglary resistant rating of vault doors according to the lenght of time they withstand attack by common tools described in following section. Testing is based in the total working time to result entry. Lock Mechanism - The objective of this test is to ensure that the high quality and security locking mechanism installed can withstand intense/violent attemps to break in to release the boltwork. 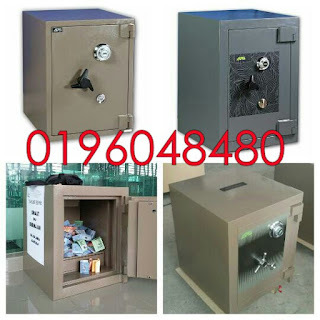 In this test, the lock box, lug, carrying bar, or other parts of the lock is punched, pried, picked or cut to impair the locking mechanism, and force open the door. Cutting An Opening - This test is carried out to verify if the door is able to withstand massive attacks or forced entry through the exterior. A 96 square-inches (619cm2) hole will be cut through the door or the door frame. Cutting Locking Bolts - This test is designed to verify the endurance of the bolts. The Testers will attempt to cut as many bolts as necessary to open the door. Emergency Door - An Equivalent Emergency Door may be fitted. The Emergency Door is also UL Listed. Grille Gate - A stainless steel pr painted finish Mild Stell Grille Gate may be fitted for ventilation of vault during the day or as control when the door is open. The Grille Gate is secured by two 5-lever Mortice Deadlocks. Finish - The door comes standard with painted grey primer based finish with an option for a stainless steel cladded finish.